Where Can I Find the Teamspeak Password? You can find the TS3 Password here. How Do I Apply to the Website? Under the Recruitment Bar on the left click "Apply", it will prompt you to create a Shivtr account or login if you have an account already. You'll be taken to our application once you've filled that out. Enter your information as completely as possible. Wait until one of the Officers have reviewed and accepted your application and then you will have full access. By default when applying to the website you add a character to the roster. 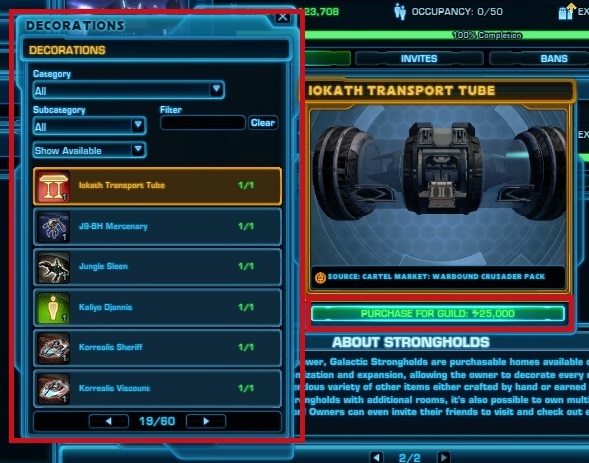 To start hover over "Roster" in the menu tab to the left. There are two ways to go: "Members" or "Characters". 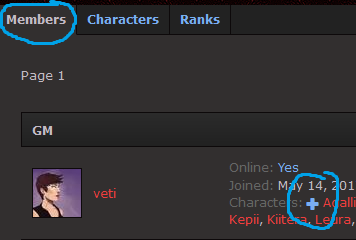 For the first, "Members" tab, scroll down until you find your account name. You should see your information, and there will be a blue plus sign next to your characters. Click that symbol and it will open up the character form. The second, "Characters" tab, click the "Add Character" button at the top. That will also open up the form. 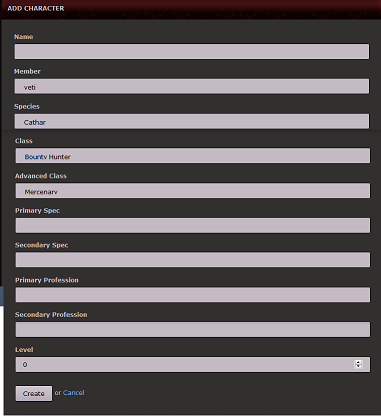 In order to create a Republic or Imperial character make sure to scroll down in the Species section of the form and select one. Can I Help Recruit to the Guild? Definitely! Take a look at the protocols of recruiting for the guild here. Can I Submit a Guide? Yes! Make sure to send a direct message on the website with the link and title of your guide to Lglowheart or Veti so they can review it before you post it in the forums. If you have any further questions please reply to this post! How Do I Donate Decos to the Guild Bank? There are a few different ways to donate, one can be straight from your deco list and the other decos can be dropped into the guild bank. This is the most preferable way because you get to keep the decos and donate copies. 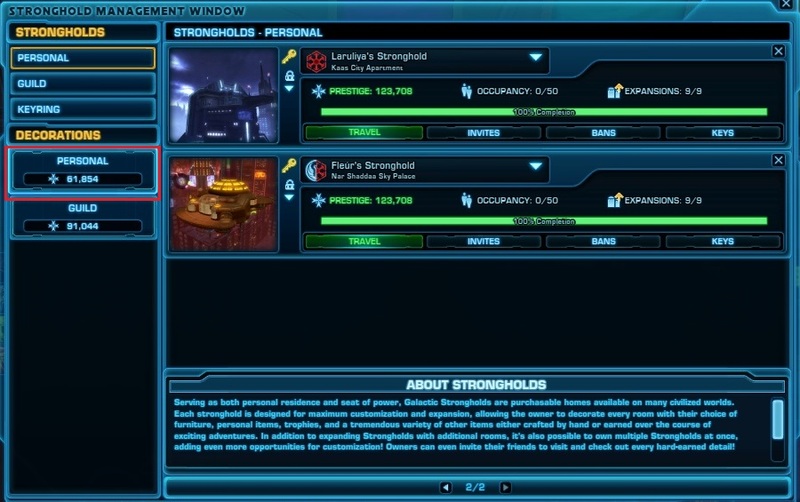 Press U for your strongholds and on the left side click on Personal. 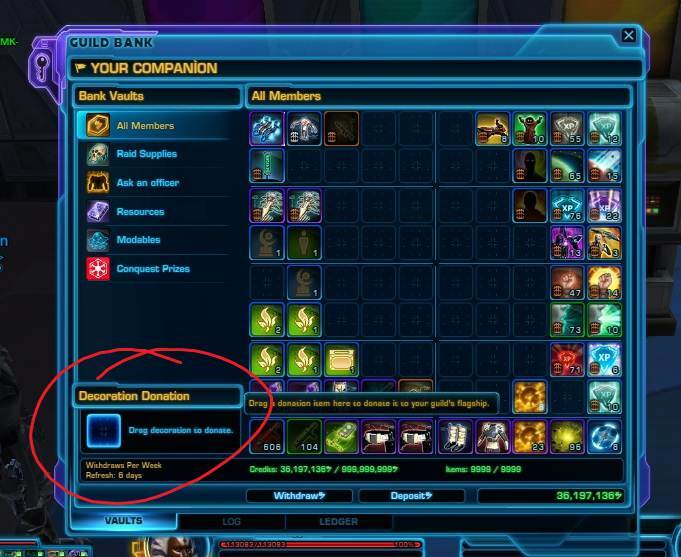 Under the decos there will be the option to donate to the guild. The prices range from 25k to 1mil. Some decos are rare and can be pricier. Select the Guild Bank and look at the bottom left. Drag the deco you want to donate and drop it in that box. Make sure to select "Yes" on the right side when it prompts the question. If you accidently click "No" it will be put in the Guild Bank Vault where you can pick it up again and retry. Who can mark my character as my main in the guild? If you are a recruit you can ask any Officer, LT, General or GM to. If you are a member you can mark it. I'm a member, how do I mark my character as my main? Click G to open the guild window. 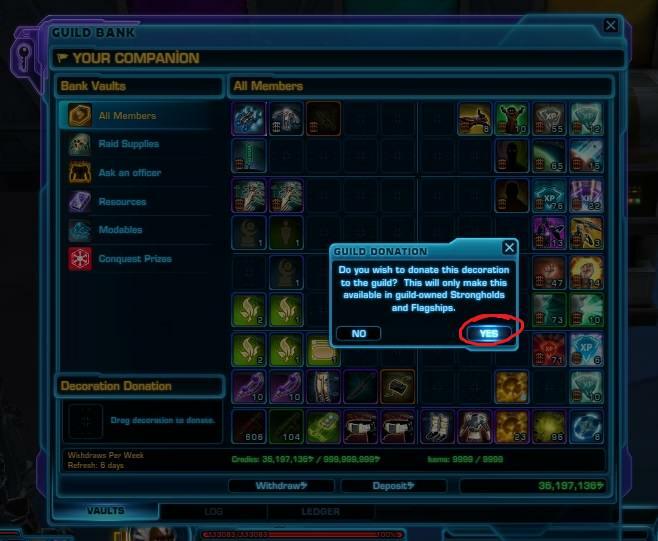 Right click on your character's name and under Guild click Set as Primary. A star will appear next to your name indicating it as your main.